November 2014 is certainly a landmark month for Artemis Art. Not only did we turn 3 years old this month, but for the first time we participated in a foreign art fair. 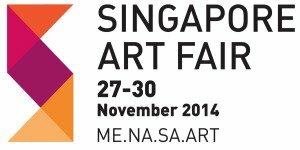 And the art fair we chose to debut for our first outing outside of Malaysia was the inaugural Singapore Art Fair, held at the Suntec Convention Centre Singapore, from Thursday to Sunday of last week. Focusing on art from the Middle East, North Africa, and South & Southeast Asia (ME·NA·SA), this new art fair aims to be one of the premier art events in the island republic. Artemis Art featured four artists for this outing, two each from Indonesia and Malaysia: Budi Ubrux, Dedy Sufriadi, Nik Mohd Hazri, and Sabri Idrus.